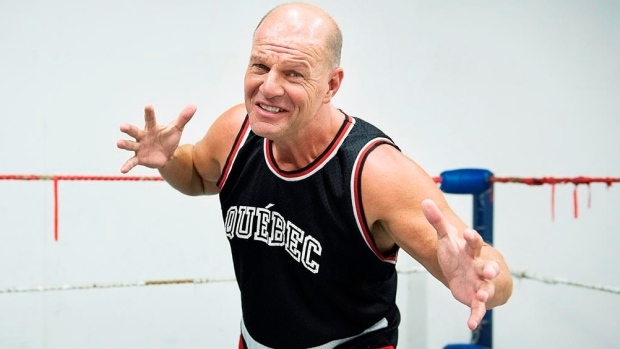 MONTREAL — Members of one of Quebec's most famous wrestling families will enter the squared circle one last time Saturday as local legend Jacques Rougeau hangs up his boots for good. When he wrestles with his three sons for the first and last time at Stade IGA on Saturday as part of a show he's promoting, the 58-year-old insists it will be his last hurrah and that of his clan. "Tomorrow night is my last show, with my three sons," Rougeau said in an interview Friday, sometimes fighting back tears. "I think it's the end — it's been 75 years, but we did good, the Rougeaus did really good." The Rougeau family has been involved in wrestling dating back to the 1940s and spanning four generations. But Rougeau said his three sons — aged 28, 25 and 18 — simply don't want to carry on with what has been the family business. Rougeau is best known to a generation of wrestling fans as one-half of famous tag teams that are part of World Wrestling Federation lore, including The Fabulous Rougeau Brothers with his brother Raymond and, later, The Quebecers, with another local product, Carl Ouellet. He also had success as a solo wrestler dubbed "The Mountie" and won an intercontinental title and a few tag team championships with the company now known as World Wrestling Entertainment (WWE). Rougeau has previously "retired" twice during his professional career, but as is sometimes the case in pro wrestling, retirement doesn't always stick. His years of criss-crossing the continent 25 days a month long done, Rougeau has spent the better part of 18 years promoting family-friendly shows in Quebec, sometimes wrestling and training aspiring grapplers out of an eastern Montreal space. "For the last 20 years, I started a family show where there's no violence, kicks, no punches, no girls, no alcohol," Rougeau said. "But my three sons made me understand they were doing it for me: they were living my passion, my dream." Rougeau said his oldest son, Jean Jacques, quit several years ago and lives in British Columbia. Middle son Cedric managed a tryout with the WWE, but soured on the business. And his youngest, Emile, also had no interest in going ahead with a wrestling career. "I'm 58 years old, I can't keep doing what I'm doing now," Rougeau said. "I'm in great shape, but I'm still 58." So the elder Rougeau persuaded the boys to have one more match, a carbon copy of how his father, Jacques Rougeau Sr., bid farewell to his career three decades ago. "I'm doing the same thing as my dad did 30 years ago," he said. Rougeau will be making a clean break from the business after 41 years — he even shuttered his 20-year-old wrestling school in recent weeks. The type of show he promotes — for ages four and up — is unrecognizable to today's average wrestling fan. Instead of an emphasis on violence and sexuality, the characters who highlight the card are based on comic and pop culture icons like The Mummy or Spider-Man. Rougeau has focused on youth over the past 18 years, travelling the province to speak out against bullying and intimidation at Quebec schools, using his own experience from professional wrestling locker rooms as inspiration. So Saturday's crowd will include 8,000 kids from schools, day camps and youth centres being bused in from around the province and fed thanks to donors. Not many tickets remain, with 11,000 fans expected at a stadium that normally hosts tennis. Rougeau says he'll pay tribute to some local Quebec talent from bygone years. "Anyone who is a wrestling fan of the old days, they're going to love it," he said. Rougeau said he will continue doing public speaking engagements for another five years. "In the last week, I've been sitting at home and sometimes I start to cry," he said. "But I can't put it on my sons to keep (the family name) going if they don't want to do it."